London restaurant includes self-service touchscreen technology and a digital menu board with easy to use Repeat Signage. We work with distributors and reseller partners across the world in the AV, IT, graphic design and software sectors and niche markets. Repeat Signage Media Wall digital signage software at Velo Restaurants. There are two parts to setting up multiple screen media or video wall with Repeat Signage. Firstly, you need to connect your screens to your computer and correctly configured with Windows. 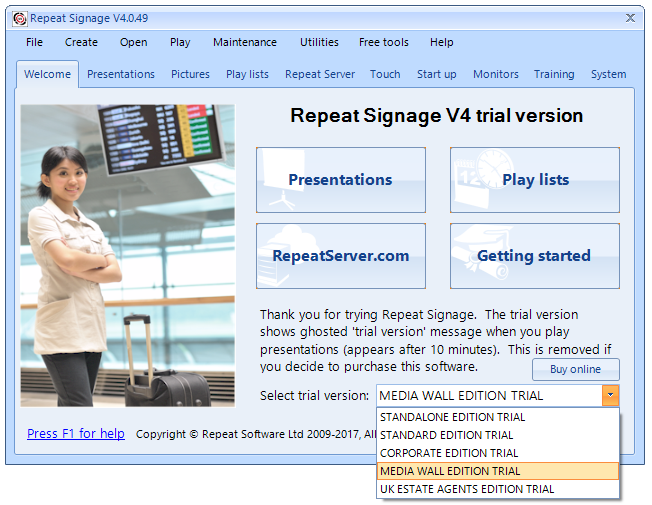 Then install Repeat Signage selecting the Media Wall Edition Trial version, or activating a purchase. You will need a Windows based PC to use Repeat Signage Media Wall edition. Most desktop computers come with a single port graphics card so that only one screen can be attached. In order to attach more than one screen, to form a media or video wall, then you need additional graphics ports. This can be done by replacing your existing graphics card with either a dual or quad port graphics card. If you have free slots in your computer's motherboard, you could insert additional graphics cards as well. Dual cards tend to be cheap, whereas quad port cards are expensive. If you require a quad screen system, then you would consider using two dual port cards instead. You may need help with the configuration in Windows as a second graphics card may try to use the same resources (IRQ) and you may need to change the settings in the Windows Device Manager. If you do not have an IT Department within your organization, you may need help from a local computer store or IT professional with the hardware setup. Specifying PC hardware recommendations is harder with the Media Wall edition. It all depends on the content used within your presentations. For example, if you are using still images on each screen, with little moving content, then basic graphics cards is all that will be required. However, if you are spanning HD video between multiple screens, then you are going to need 256Mb or greater graphics cards and the more screens attached, the more dedicated graphics memory will be required. If you already have dual or quad port graphics cards, then please download the trial version of Repeat Signage and do a full test with your hardware. In some cases, you may need to simplify presentations if your hardware will not play presentations smoothly. For minimum requirements for any edition of Repeat Signage, please see Systems requirements for Repeat Signage. HD video playback on screens other than the primary is NOT recommended with the Video control. Use the new Flash video control instead. You will need to convert your videos to Flash FLV format using free version conversion software. which allows Repeat Signage to then use all the screens attached to your computer. If you have already purchased a licence, then this can be activated from the 'Help' menu. 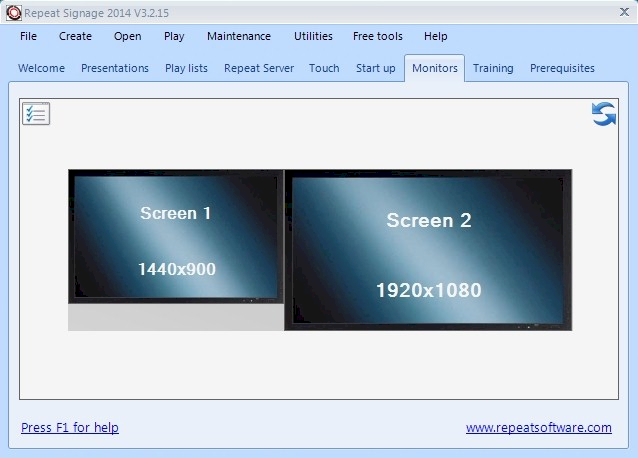 The Standard edition of Repeat Signage actually supports dual screens. We don't advertise this anymore as it was confusing users as they wanted to use it on two screens in different locations. If you just need a two screen media or video wall, then use the Standard edition trial instead, and purchase the cheaper standard edition licence if you decide to buy. and you need to click on each screen in turn and make sure that there is a tick in the 'Extend the desktop onto this monitor' tick boxes and use the Apply button. You next need to use this Windows screen to drag and drop the monitors so that the arrangement on screen matches the monitor's physical arrangement. For example, if you have 4 screens, you would put them in either a vertical or horizontal row, or make a 2x2 grid, or even have them all in a diagonal row. You need to use the Windows Screen Resolution screen (or Display settings in Vista/XP) to do this. Drag and drop the screen pictures and then click on Apply. When you have finished, try moving your mouse between the screens. If the mouse moves between screens correctly, then you know you have everything set up correctly. If you move your mouse off one screen and it appears on the wrong one, then check the arrangement in Windows Screen Resolution again. Individual screens can also be set to portrait mode (screen mounted vertically rather than horizontally) if required. Do all the screens have to be same size? No. You can have different screens with different numbers of pixels attached to the same computer. Can I mix screens in landscape and portrait modes? Yes. Just use the Windows Screen Resolution (Windows 7 and 8) or Windows Display Settings (Vista) to change individual screens to portrait mode. 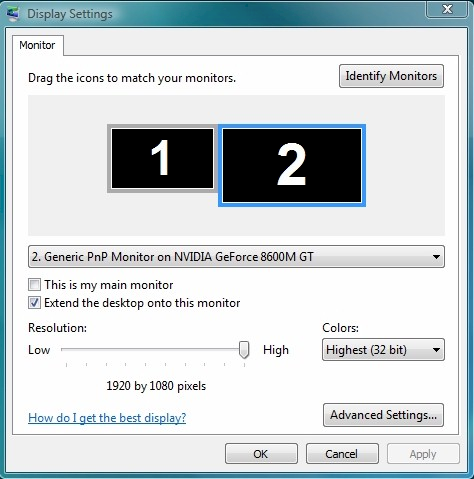 The monitors on the Windows Screen Resolution screen are not in the same order as the physical screens are. How can do I fix this? 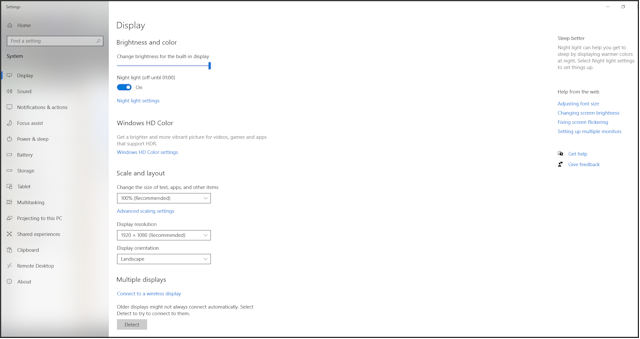 Use the Windows Screen Resolution (Windows 7 and 8) or Windows Display Settings (Vista) to drag and drop the screens until the arrangement in Windows matches the physical arrangement and then click on the Apply button. The team at Velo Restaurants, London, has used Repeat Signage Media Wall since 2011 to display their menus and timely and seasonal offers to their customers on a Panasonic 4-screen video wall. They upgraded to V4 to take advantage of the exciting new features. "Repeat Signage V4 Media Wall worked well, especially with Windows 10, without any glitches." Nghi Nguyen, Founder, Velo Restaurant. Repeat Software worked with a US based digital artwork installation company to set up a 'donor wall' in a large US hospital. 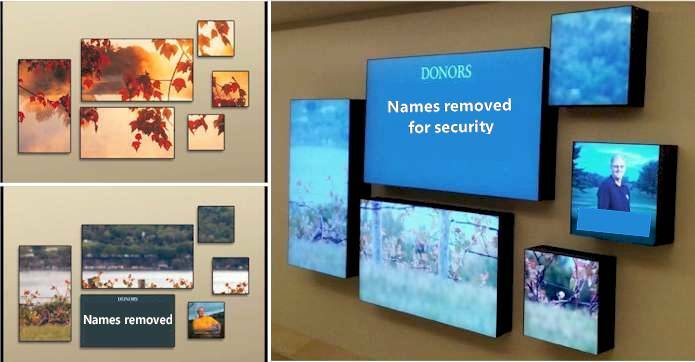 This was a 6 screen installation to display thank you messages to people and organizations that had donated money to the hospital. Beautiful background images spanned all 6 screens, and then changed some or all of the screens simultaneously every 15 seconds. Along with background images, Microsoft Word documents with the names of people who had donated, and also images of patients, doctors and donors are displayed on individual screens." Full case study.